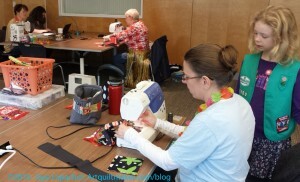 I went to the BAMQG Sew Day last Saturday. 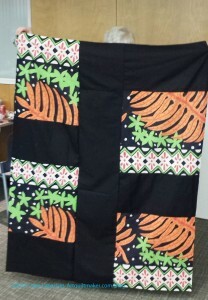 We had a great time making Hawaiian themed quilts. We made 10 tops and 5 backs. Kelly was on back detail, so she did most of them while others of us did the tops. 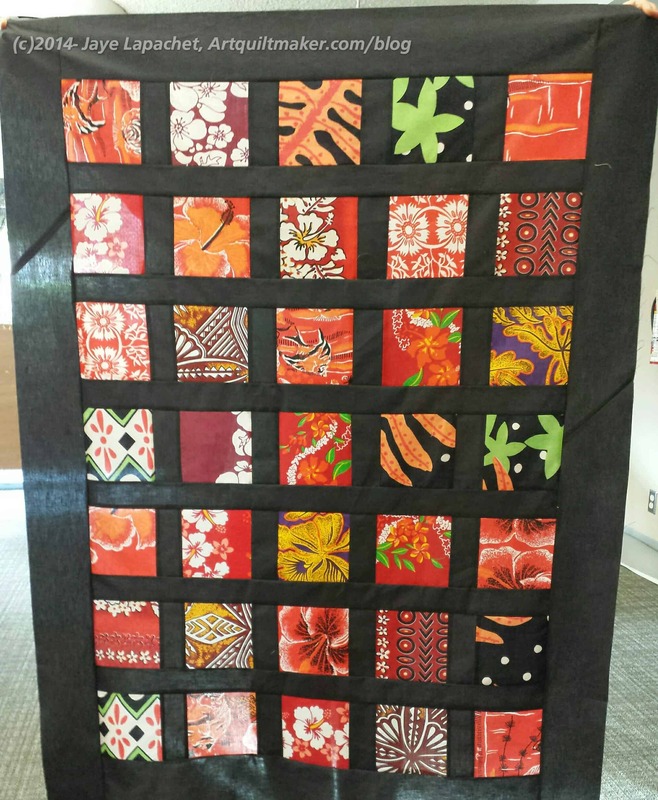 These quilts are for a family who lost their beloved mother/grandmother recently. The fabrics are from her stash and some from curtains and her mumus. All are Hawaiian prints. Gerre and I worked together. Gerre was already sewing away when I got there. I stepped in and began ironing and pinning and we ended up making the top (left). Angela arranged the whole project and picked the pattern. I was grateful that it was pretty easy. She is great that way and figured out fast that if we wanted to get these done this century they should be easy. Also, as Frances says, the Muggles don’t know. I don’t think this is a terrible pattern at all and I don’t mean to imply that it is. Simplicity is wonderful. 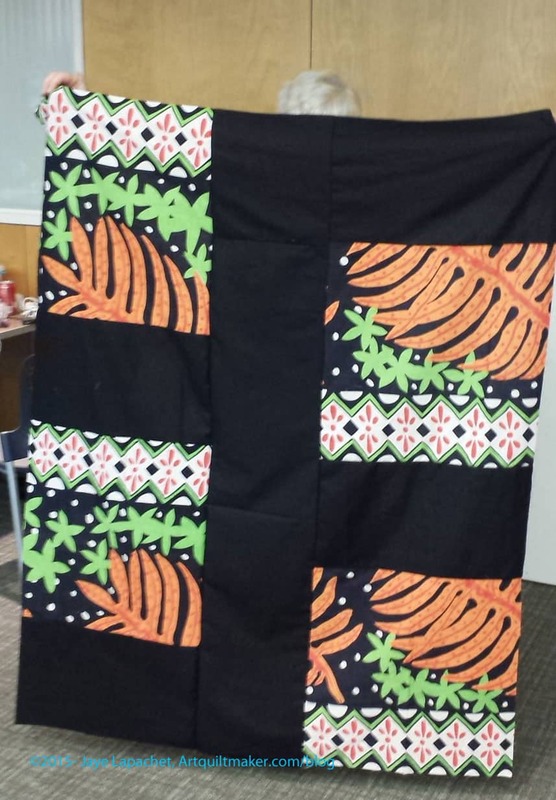 The black/dark grey really sets off the bright Hawaiian fabric. I think that people who are unfamiliar with the process can appreciate simpler patterns much better. Not that they aren’t capable, but if you don’t sew, it is hard to appreciate the work that goes into something complicated. Gerre and I did have to contemplate our piece. We wanted some variety in the fabric despite all the orange we had to work with. The picture above shows the piece laid out on our design floor right before we were were going to sew the sashing. The backs were pieced with big pieces and they came out fun, because of the motifs on the large Hawaiian prints. Once the backs were made, Angela distributed batting and Gerre and I moved on to Postage Stamp blocks. We made 16 and I will piece them into another donation top. This back was made by Peggy and I like the combination of the diamond pattern and the large leaves. Some people will take the quilts home to finish then bring them back for others to quilt. Gerre is going to quilt ours while I bind the Pink T quilt, then she will give me the Hawaiian quilt and I will bind that one. 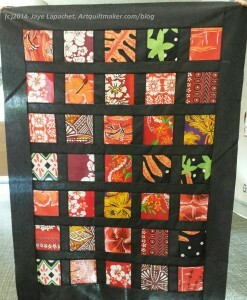 She has a goal of quilting a certain number of charity quilts this year and I intend to help her! We work very well together and it is great to have a sewing buddy at Sew Day. We also had our own personal girl Scout present. She came to keep us supplied with cookies. I think she also took an interest in our sewing. We have to tempt the young ones and Amanda is doing a good job on that account. You made me want to have a sew day! Though only if I could get my own personal Girl Scout to supply me with cookies too. 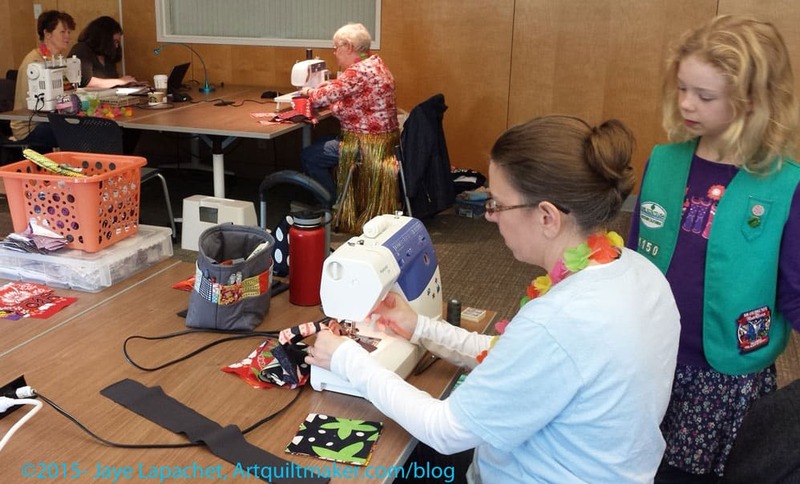 What fun–and great job on all those donation quilts. Simple does work very, very well. It really works, because I have pal who brings her sewing machine and sews while I run around cutting and pressing. I don’t like lugging my machine around so I usually bring cutting, etc, if I am not sewing with my pal. sounds like a fun and productive day! Were these for donation, or commissioned by family? We really got a lot done!